It’s 1978, and Dale Singleton is becoming alarmed as his friend, Ian Kaysen, is afflicted with a mysterious and seemingly untreatable illness characterized by pneumonia, lesions, and dementia. This novel of the first days of AIDS is viscerally affecting, as it conveys the shocked puzzlement of those troubled by Ian’s condition while simultaneously documenting Jamaican society’s struggle to accept the dignity of gay love. Dale’s world collapses, yet his experience of being gay in a middle-class culture circumscribed by church, family, and compulsory heterosexuality is hauntingly memorable-and familiar. How does the community response to homosexuality in Powell’s Jamaica compare with how homosexuality is viewed in American society today? How is homosexuality viewed in your own community? “Ian Kaysen, I don’t mean to interfere in your personal prerogatives, but that rattle in that back of your throat not any little play-play cold. You going to have to do something about that coughing” (p.1). Ian’s illness progresses from this point and we know that he is suffering from AIDS. Discuss how the foreknowledge of HIV/AIDS shapes our understanding of the novel. “Nevin didn’t seem to mind the friendship at first…But after him see how Ian get his own set of keys, how him sleep over on the couch downstairs in the living room some nights…all of a sudden Dale notice that every time Nevin come home and see Ian, a scowl seem to always envelope his face…”(p.6). What does this passage tell us about Nevin’s character? Dale recounts his earlier experience of confessing his homosexuality to a church elder on page 10. What does this passage reveal about the conflict between his sexuality and religion? “Dale wonder if Nevin was going to strike him. Grab his head and ram it against the wall. Like the time him come home sudden and find Alexander. Cause twelve stitches across the middle of Dale’s forehead…If Nevin lick him one more time, that was it” (p.24-25). This passage is the first example of abuse portrayed in Nevin and Dale’s relationship. What does this imply about their relationship? What does this foreshadow? Ian’s blind devotion to his mother is an important thread that runs through the novel, with tragic consequences. What does this relationship tell us about traditional Jamaican culture? Compare this relationship with the other parent/child relationships in the novel. Dale’s dream of a more equal life with Nevin, running the store together, seems hopeless because of Nevin’s philandering. Discuss Nevin’s need to hold the power in the relationship. How does this recur throughout the novel? “Nevin was dashing him aside. Like his mother had left him. And his father before her…For if Nevin wasn’t there anymore, who was going to believe in him? Who was there for him to cling to? Who would make him feel safe?” (p.57). What does this passage reveal about Dale’s character? What affect might his earlier experiences have on his relationship with Nevin? How does Powell’s novel dispel or support homosexual stereotypes? Discuss the symbolic significance of Dale’s dream on pages 124-125. Ian’s birthday party …was a small gathering (emphasis added). Twelve, fifteen people. Bill paid a local poet to recite a few poems. Somebody played the piano quietly in the background. Ian was looking the happiest that Dale had seen him in a while, except for fleeting moments when his eyes would begin to glance inwards” (p.125). This passage could serve as Ian’s living wake and it’s the closest the author comes to using her title. 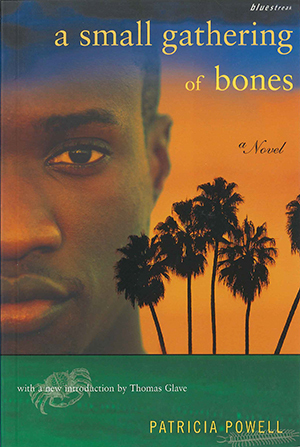 Discuss why the author chose A Small Gathering of Bones as the title. Considering the society’s views of homosexuality in Powell’s work, what would you expect the response to the discovery of AIDS might be? What was the American response to the discovery of AIDS? How does one’s culture or religion affect their perception of AIDS?